Happy New Year, Tachyon...and thank you for all the wonderful information you post for us. BaroqueAgain1 wrote: Happy New Year, Tachyon...and thank you for all the wonderful information you post for us. 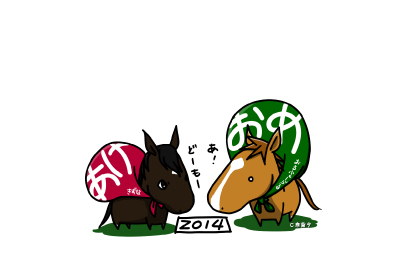 According to Oriental Zodiac, 2014 is a year of the horse. Hope 2014 will be a fantastic year for racing fans around the world. Here's a New Year Greeting card that could be popular..
Interestingly, I've seen ads on TVG for the Keeneland sales, and they promote 2014 as The Year of the Horse, and that it would be the perfect year to buy at Keeneland. I suspect that Keeneland is adding this Oriental note to their ads to help attract buyers from Japan, Hong Kong and China. That is adorable! Happy New Year to you also! Happy New Year from Turfy, too!! Oh, my- Turfy is friends with Hello Kitty?! Love that! And she is a super jockey, too, haha. Air Messiah(JPN)(G1 winner, Cesario's chief rival) in foal to King Kamehameha at Shadai Farm. She has been booked to Empire Maker for 2015 foal. Not sure if she is a ''well-known'' mare. But I was just fascinated by this Big Red Farm's beautiful picture. I agree, tachyon. It's a gorgeous picture.